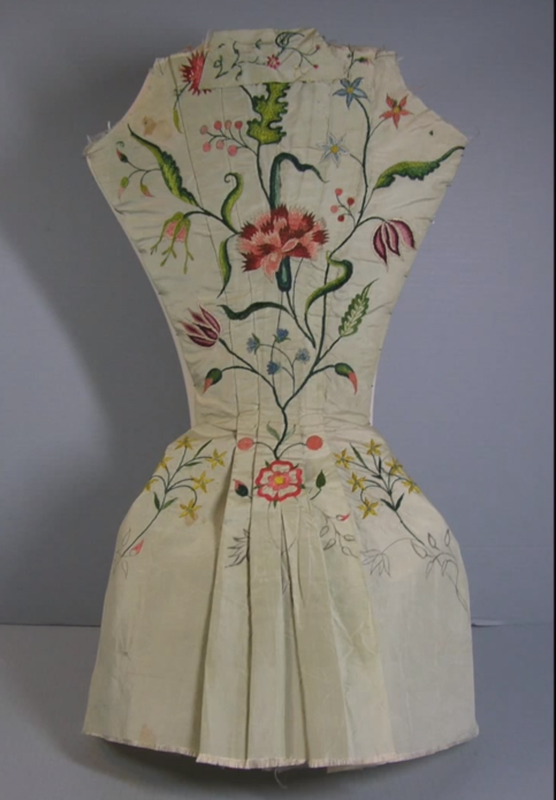 As I wrote this blog post on Elizabeth Bull's embroidered wedding dress from The Bostonian Society earlier this week, I realized I'd need a second post as well to share all the interesting things I'd learned about the dress - as well as a mystery about it, too. Since so many of you wished to know more about Elizabeth herself,and what happened to her (and the dress) after her marriage, I'm including that, too. Although the dress has been updated and refashioned several times in its history - it currently reflects the styles of the 1830s - there's a hint that perhaps it might have been changed even before it was first worn. Preserved along with the dress is an item referred to as the "practice bodice," left, a fitted back section of a dress bodice, that is currently on display at the Old State House in Boston. 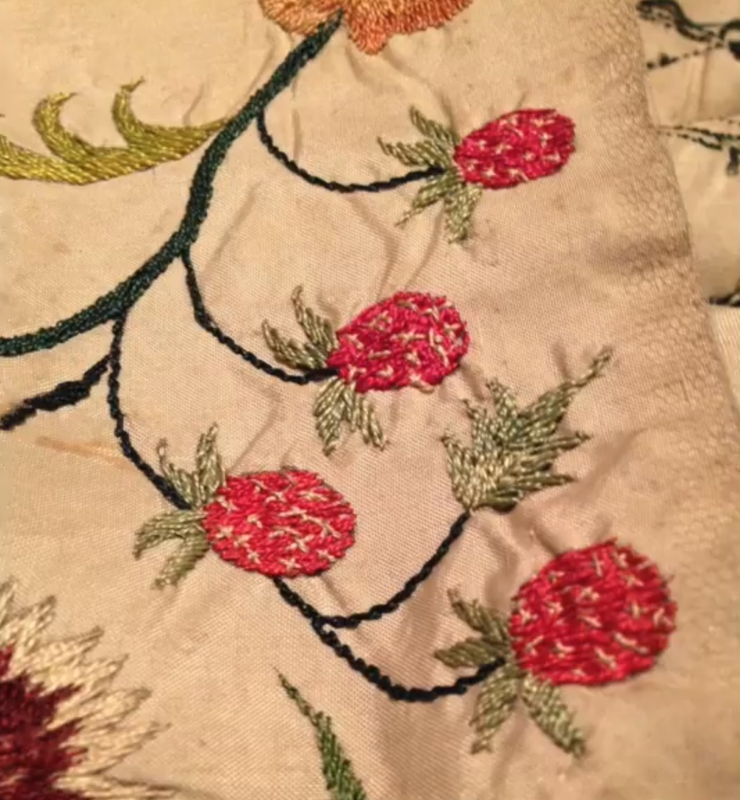 While no one knows for sure, historians have decided that this was a trial run for Elizabeth's embroidery, a test piece before she began on the actual dress. 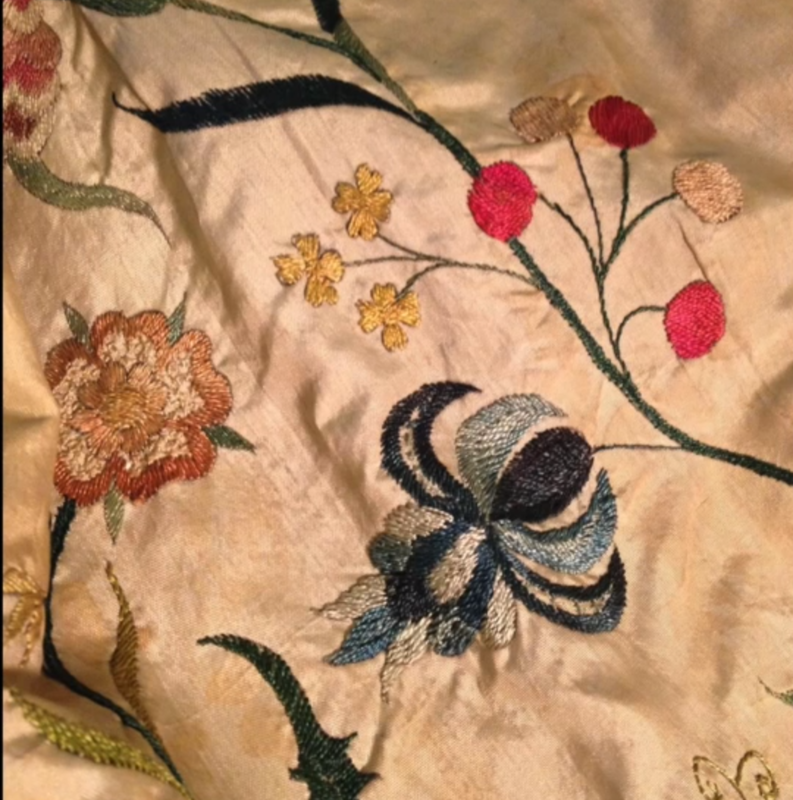 As anyone who has embroidered with silk, on silk, will know, it's not easy, and, once stitched, it's also very difficult to pick out to correct or change a design. Given that Elizabeth was only fifteen or so at the time, perhaps her mother or embroidery instructor suggested this step to help build her confidence. Or...perhaps this once was the actual back of the dress. Certainly there's nothing "trial" about the design or the stitchery. 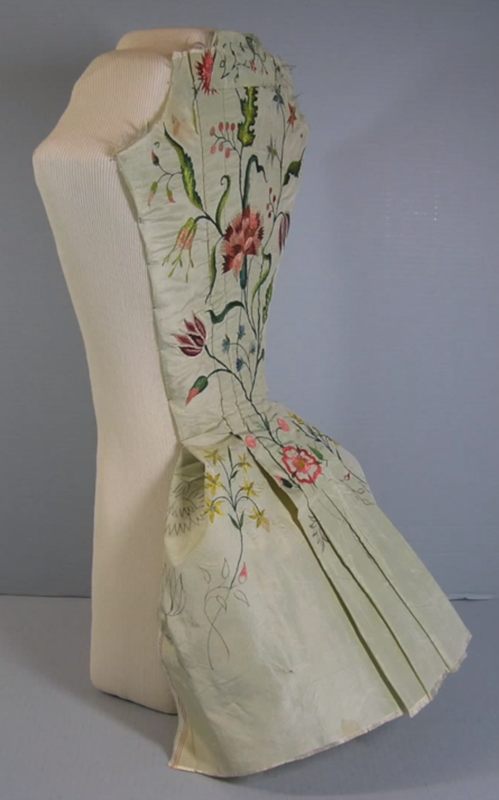 But once that embroidery was complete, there'd be no possibility of making adjustments in the vertical pleats that shape the back of the bodice. What if in the years in which she worked on the dress, she grew in size to the point that the narrow back no longer fit and needed to be replaced, and a newer section was inserted? Or...perhaps Elizabeth changed her mind regarding the dress's style. She was obviously fashion-conscious, and cost was not an issue to her. A new style in women's gowns was appearing from Paris during the time she was working on her dress. The robe à la Française, or sack gown, replaced the earlier fitted back with a series of open pleats that flowed gracefully down from the shoulders into the skirt. (Here's an example from 1730-40, and here's a replica of a similar dress being made by the mantua-makers of Colonial Williamsburg that shows the pleats more clearly.) Could it be that Elizabeth wished to follow this new style, and discarded the original, now-old-fashioned back? These possibilities are only musings of my own; novelists can let their imagination ramble, while professional historians can't. No one knows for certain, and neither the back of the dress as it stands nor the practice bodice offer many clues. But it's a tantalizing mystery, isn't it? What happened to the Elizabeth and her wedding dress? In 1734, she married an Englishman, the Reverend Roger Price, a commissary of the Church of England; he was twenty years older than she, and it was a marriage joining prestige and fortune. Soon afterwards, the couple moved from Boston to a substantial house in rural Hopkinton, where Rev. Price started a new church. Elizabeth continued to wear her wedding dress as her "best" dress, as was customary for 18th c. brides, and was known to charm the friends and parishioners of her sometimes prickly husband. Elizabeth gave birth to eleven children between 1735-1753, five of which survived to adulthood - a sadly average figure for the time. In 1754, the couple sailed to London, leaving their considerable property in Massachusetts behind. They never returned. They were considered Loyalists, and during the Revolution, they lost their property and assets. In 1783, her oldest son and daughter returned to the Massachusetts, and successfully recovered most of the family property. Elizabeth herself died in 1780, aged 72. I find it fascinating that despite so much political upheaval, Elizabeth's family kept the dress, as well as other examples of her needlework (look for another blog or two in the future!) I like to think they did so not only as mementos of a well-loved mother, but also in recognition of her skill and artistry, talents that were clearly so much a part of her. And the dress? Family legend has it that the dress traveled to London with Elizabeth in 1754, and that in time it was remodeled and worn by her oldest daughter to the court of George III. As before, many thanks to Patricia Gilrein, Kimberly Alexander, and the staff of The Bostonian Society for so generously sharing Elizabeth's dress with me. All photographs courtesy The Bostonian Society. Thanks for this fascinating continuation! Hey there. My mom had sent me a link to your blog. I love it. I'm a history blogger as well... kind of. I write about discovering history through metal detecting and dump digging--its a dirty job, but discovering the history makes it worth it! 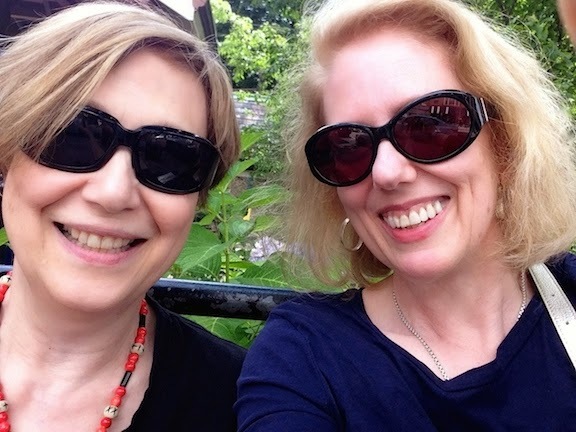 I invite you to check out my blog! www.relicrecoverist.com.